There is a seminal piece of video footage from the 1989–90 Whitbread Round-the-World Race when the two Kiwi archrivals, Peter Blake and Grant Dalton, were going at it hammer and tongs. Shot from a camera aboard Dalton’s Fisher & Paykel, Blake’s “Big Red" Steinlager is close aboard off Dalton’s starboard quarter, surging and then retreating on each wave, sometimes hooking into the crest properly and surfing forward, throwing up a great bow wave. Then Dalton’s boat connects with its own wave and moves ahead again. It is precisely this sort of open-ocean sailing that Sojana’s British owner, Peter Harrison, had in mind when he commissioned Bruce Farr to draw his new yacht, Sojana, whose lines and ketch-rigged sailplan recall such famous Farr-designed maxi-racers as Steinlager, Fischer & Paykel, and New Zealand Endeavour. But there’s also a twist. While Sojana certainly has long legs, she also offers comfort and luxury that you can sink into, stretch out across, and ponder on just how fine life can be. For Harrison, the yacht is a considerable jump up in size from his Hallberg Rassy 55—unless you count the America’s Cup yachts he’s built in between. 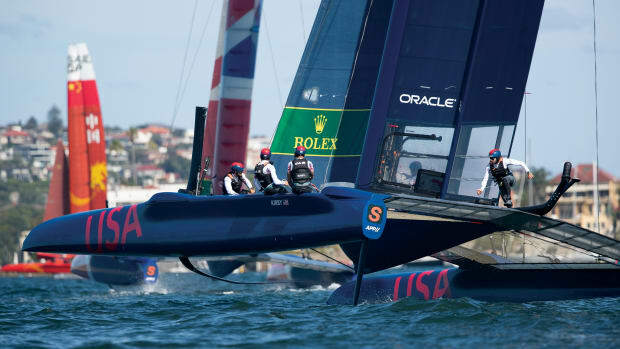 Harrison bankrolled the 2003 British America’s Cup challenge. He first bought the assets of the 2000 Nippon Challenge and then built Cup boats GBR 68 and 78. While he has said he will back the next British challenge, he won’t be doing it alone. Other sponsors will have to contribute half of the budget, and at the end of November there was grave doubt that would happen. I was able to get a taste of Sojana’s tremendous reaching capabilities when I joined the yacht at Mogan, on Gran Canaria. While the Canary Islands are as much a tourist magnet for Europeans as Florida is for North Americans, they are also a very good staging post for crossing the Atlantic. Sojana had sailed down to the Canaries from her homeport of Cowes in the worst of the North Atlantic winter. The Biscay crossing was tough, but, according to Harrison’s long-time skipper, Marc Fitzgerald, it was a baptism by fire that Sojana survived successfully. Mogan is a tricky place for a large yacht like this, with her high freeboard, skinny foils, and two towering spars. This became especially obvious when we discovered that our bow anchor had picked up someone else’s chain from the seabed clutter as we slipped out of our berth. Although it took the crew just 10 minutes to clear the mess, it was graphic proof of how important it is to have a 40-horsepower thruster at the bow and a 30-horsepower thruster at the stern. Instead of falling down onto the bows of moored fishing boats, Fitzgerald easily kept the yacht under control while the tangle was being cleared. The thrusters are telescoping devices that run off the big 27-kilowatt Lewmar Commander system. Fitzgerald also performed a precise pirouette later in the day, turning Sojana about her midpoint. 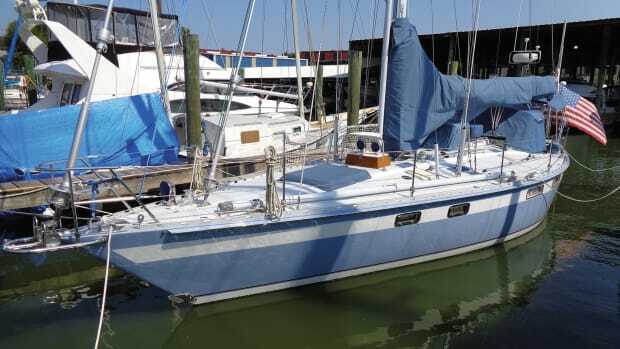 Without the thrusters, he’d have been forced to turn the yacht around outside the harbor, back in stern first, and then tackle a 90-degree turn. You don’t do such things in a large yacht like this unless you have the proper tools at your disposal. Fitzgerald’s maneuvers book-ended a great day of sailing on the deep-ocean blue Atlantic just outside the harbor. Hydraulics and high-strength rope have transformed the horrors of wire halyards and sheets that were commonplace back in the Steinlager 2 era. The standing rigging on Sojana’s cap shrouds and diagonals was stainless steel when I was aboard, but Harrison plans to change to a full PBO fiber system. Sojana’s mainsail climbed the Hall Spars mainmast at the touch of a foot switch, as did the mizzen, jib, and staysail. 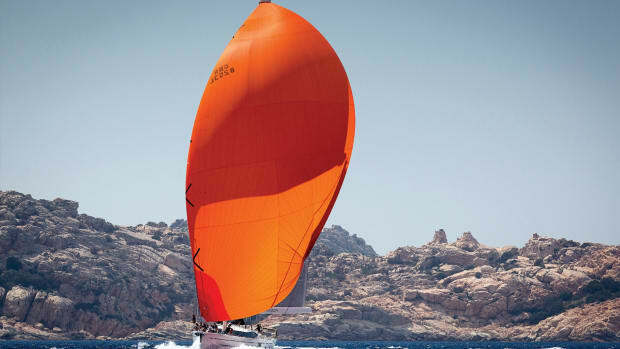 In just 10 minutes Sojana was leaning to the breeze with all plain sail set, making 10 knots in a true wind of 10 knots. At least that is what the giant B&G displays at the base of the mainmast were saying as we passed through a pod of pilot whales. Over time this will be an important feature. Sojana is signed up for long races, such as the New York Yacht Club transatlantic race to Europe this May, and for plenty of shorter round-the-buoys races. “The yacht has six modes of sailing,” says Fitzgerald, “which run from full-power racing to pottering around with a few friends on board.” The four permanent crew are augmented when needed because trimming the mizzen requires more hands than a conventional sloop does. Designer Bruce Farr believes that Sojana will “go upwind a lot better than most people expect,” and the numbers I was seeing on the readouts certainly suggest that. The mizzen does have a big bearing on the yacht’s balance, and one thing the crew learned well on the thrash across Biscay was that the two tucks that could be put in the mizzen were not enough. But the nice thing about a ketch rig is that whenever the helm is put down, more sail can go up. Sojana can set a big mizzen staysail on a furler in addition to the usual spinnaker options. Although spinnakers can also be flown off the mizzenmast, the detachable racing option was not in use off Gran Canaria, and the fixed mainmast backstay prevented them from being flown; the stay does foul the sails. The ketch profile clearly suits Sojana’s projected use, but having the mainboom dip into the water when power-reaching is something Fitzgerald wants to avoid at all costs. A common rule of thumb suggests that a fully fitted yacht over 100 feet tends to weigh at least one ton for every foot of overall length. With a light-ship weight of 96 tons, Sojana certainly can be considered light. 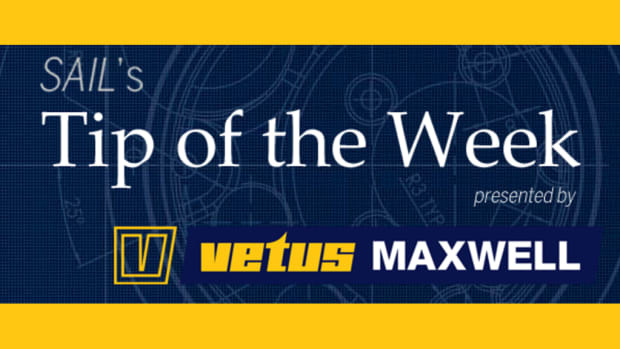 Much of the credit for that belongs to Green Marine in Southampton, England, a firm near the top of the cognoscenti’s list of high-quality, composite builders. Harrison began this project by forming Fast Cruising Ltd., with Dave Barwell as the original project manager. 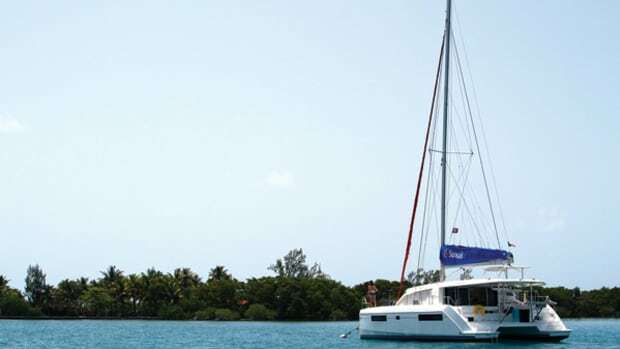 Farr Yacht Design was contracted to design the hull, rig, and foils. When John Bremner succeeded Barwell as project manager, Green Marine was contracted to build the hull, with SP Technologies engineering the structure. SP paid particular attention to a couple of features. One was the huge stern garage, which has a door large enough to launch and recover a 24-foot RIB. It also accommodates the mizzenmast and rudderstock. The main feature of the anchor-deployment system at the bow is two pairs of arms and a 6-ton hydraulic ram that can launch the 1-ton weight of a 350-pound anchor and chain. There is nothing especially new here, but the system is powerful, smooth, and effective. Smart ideas are fine, but in this business it’s the execution that ultimately counts. When Green finished the hull, the shell was moved across the Solent to Cowes and to Harrison’s America’s Cup Challenger base, a large tract of land on the River Medina that was part of the town’s once-vibrant ship- and boat-building industry. Bremner hired his skilled craftsmen from the ship and aerospace industries that had flourished on the Isle of Wight. Fast Cruising also did all the secondary bonding, which made up 30 to 40 percent of the total composite work, and Nick McGary, who has since moved aboard as engineer, developed the complex engineering systems. Once the hull and deck were completed, the finish joinerwork below was done by Die Oldenburger of Germany to a design by Mark Tucker of Design Unlimited. Tucker is also responsible for the space-age deckhouse bubble. While the structure looks small, there’s plenty of room inside along with unrestricted vision forward from the two helm stations. The fit and finish are exemplary. Die Oldenburger measured the hull shell so thoroughly that they were able to cut and finish the joinery off site before installing it. Extensive use of cored interior panels saved close to 4,500 pounds in weight. The space aft has been reserved for the crew’s berths, a large mess area, and a galley. Two guest cabins are located forward of the crew area, and there’s a third guest cabin forward of the main saloon. In sharp contrast with the slightly angular and racy hull shape, the interior dcor has a traditional dark and clubby motif that features fielded panels of Sipo mahogany. A model of Harrison’s last Cup challenger, GBR 70, has a special place in the main saloon, and Rick Tomlinson’s photographs of the Louis Vuitton Cup in Auckland are hung throughout the interior spaces. 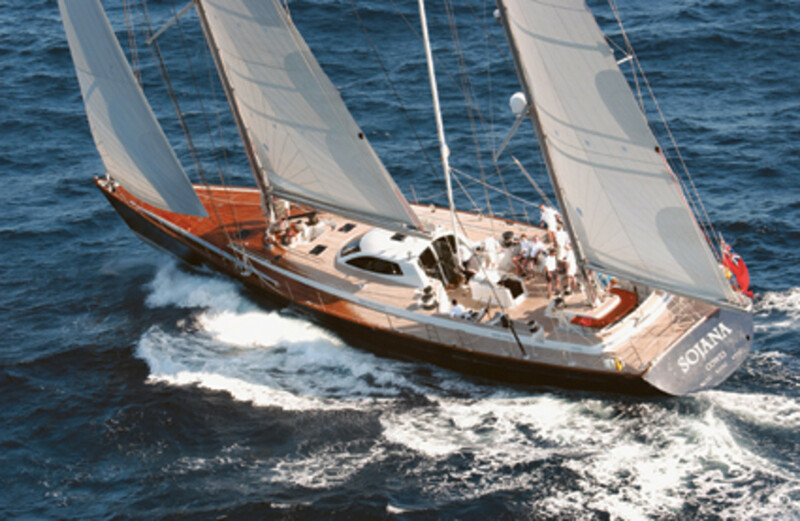 Because racing, particularly passage racing, is so firmly embedded in her genes, Sojana is in many ways a rare yacht. She has met the tough target weights demanded by her owner and has also come in on budget. “That all happened because of Peter’s depth of experience,” says Fitzgerald. “In the early sixties he was an accountant and moved in to manage the Camper & Nicholson yard on England’s south coast. When he arrived, the crew there asked him whether he knew how to build boats. ‘No,’ he said, ‘but I do know how to run a company.’ He learned a lot of things while he was there.  One that has stuck with him is that when you build a yacht, you need to have everything in the contract before you pick up a hammer to start the project." 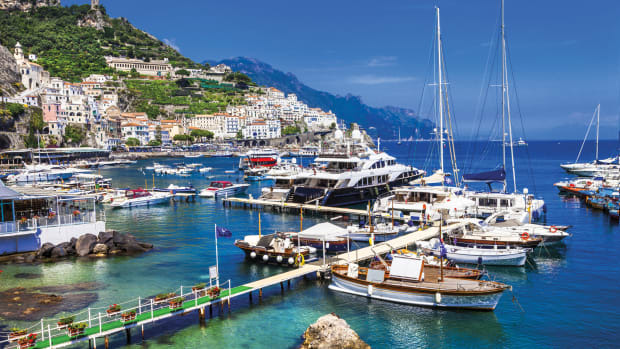 Tim Jeffery is SAIL’s European correspondent. Our design brief was for a sleek, elegant yacht that would be well appointed and also responsive and fun to sail. The yacht had to be the largest and fastest that could be handled by the owner, his friends, and a minimum number of professional crew. 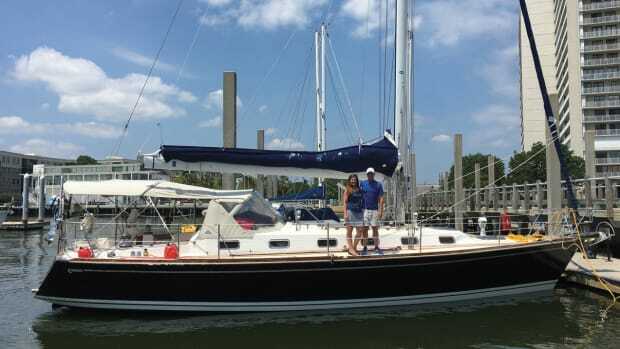 The hull and rig would be robust and seakindly and capable of doing long-range ocean cruising. But the yacht would also be capable of winning its fair share of trophies. We selected a ketch rig because of the flexibility it offers in balancing the yacht in various conditions and sailing modes and because of its power potential when reaching and running. Additional cruising stability has been achieved by designing the tankage systems so that weight can be transferred to windward when needed. The cockpit is efficient for cruising and racing and has a seating area aft where crew and guests can dine in comfort. A spacious cuddy forward provides good protection from the weather. Full-size mockups of both the cuddy and the cockpit were built before the final design decisions were made. The interior has been beautifully designed by Design Unlimited with cored-mahogany paneling and detailing. Although all fixtures, fittings, and materials have been carefully selected for their light weight, they still manage to provide a luxurious superyacht feeling.